It took 15 hours for 400 French firefighters to put out the fire at the 850-year-old Notre-Dame de Paris Cathedral. The cathedral, one of Paris's most famous landmarks, lost its spire and roof, but still has its iconic bell towers. The Crown of Thorns, one of the cathedral’s treasures, was rescued. The crown is believed to have been worn by Jesus Christ at the time of his crucifixion. Other religious statues were removed last week from the cathedral roof as part of the restoration of the church’s spire. Officials said the world famous 18th century organ that has 8,000 pipes also appeared to have survived. But no one can tell whether it has been damaged by water or will need to be restored. There is also little information on the condition of the cathedral’s stained-glass windows and its many paintings. A spokesman for Paris's firefighters said on Tuesday morning, "the entire fire is out." He added that workers were "surveying the movement" of the structure and the contents in it. Officials consider the fire to be an accident, possibly as a result of the restoration work at the cathedral. However, investigators will be interviewing people who worked on the cathedral's roof, where the flames first started. French President Emmanuel Macron visited the site on the River Seine Monday night. He pledged that Notre-Dame would be rebuilt. He called the structure "a part of us," referring to the country of France, and he asked for help repairing it. “We are united in sorrow. Notre-Dame is part of the cultural heritage of mankind and a symbol for Europe,” German Foreign Minister Heiko Maas wrote on Twitter. French businessmen have also pledged hundreds of millions of euros for reconstruction, including Bernard Arnault, France's richest businessman, and Francois-Henri Pinault and his billionaire father Francois Pinault. Even so, repairing the cathedral — including the wooden beams that made up its roof — presents problems. Bertrand de Feydeau is the vice president of preservation group Fondation du Patrimoine. 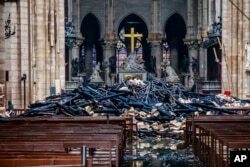 In an interview with the Associated Press, he noted that the cathedral's roof cannot be rebuilt exactly as it was before the fire because “we don’t, at the moment, have trees on our territory of the size that were cut in the 13th century." He added that the roof restoration work would have to use new technologies. This story was based on reports from the Associated Press and Reuters. John Russell adapted it for Learning English. Hai Do was the editor. restoration – n. the act or process of returning something to its original condition by repairing it, cleaning it, etc.